The longstanding joke about fusion—that it’s the energy source of the future, and always will be—may be the field’s biggest problem. The quest to bottle the power of the sun has led to countless starry-eyed predictions of an imminent clean energy revolution. But the expectations for fusion have always been outsized, the trail of broken promises has grown long, and public perception has soured. While our cynicism about fusion may feel justified, it’s also unfortunate. Because, despite tepid support and constant funding peril, researchers are making progress toward this futuristic energy source. Scientists will eventually solve fusion’s immense technical challenges, if society can commit to the journey. Last week, I visited the Princeton Plasma Physics Laboratory to tour the recently-upgraded National Spherical Torus Experiment (NSTX-U), the most powerful “spherical tokamak” fusion reactor on Earth. An 85 ton beast of a machine shaped like a giant cored apple, the NSTX-U uses high energy particles to heat hydrogen atoms to temperatures of 100 million degrees Celsius, hotter than the core of the sun. To contain this super-hot plasma, winding copper coils generate a magnetic field 20,000 times stronger than that of the Earth. All of this so that for a few magic seconds, atomic nuclei will collide, fuse, and release energy. The experiment is a step along the path toward a fusion plant that would run constantly, powering entire cities on mere grams of seawater. It’s easy to see why the field of fusion energy is prone to grandiose claims—this stuff just sounds epic. But what struck me the most from my trip to the PPPL was not the science wizardry taking place inside its giant reactor, or the Houston-style control center where dozens of (white, male) scientists crunched data and ran supercomputer simulations. It was the balance of optimism about the fusion energy future, and realism about the hard physics and engineering problems that need to be solved to get us there. 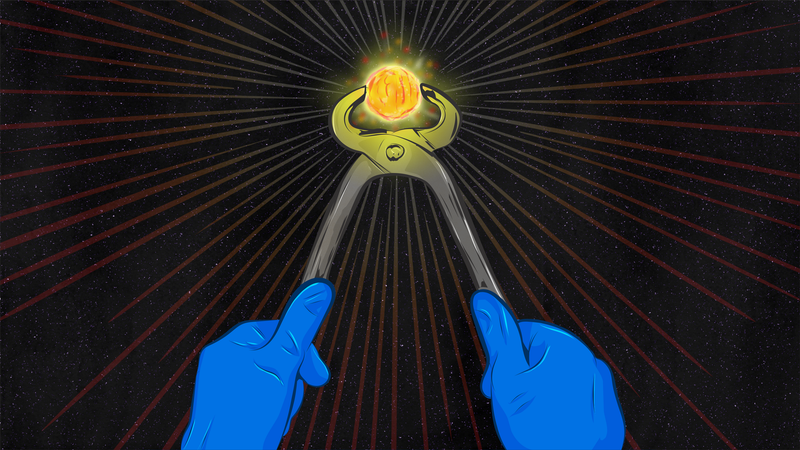 The basic challenge, as physicists first learned in the 1950s and 60s, is that fusion plasmas—free-flowing soups of protons and electrons in which atomic nuclei collide and release energy—do not like to be contained. They want to splatter everywhere, and yet, we need to contain them, at high enough pressures and for long enough time intervals that we can produce more energy than we put in. Our sun contains plasma with its immense gravity, but here on Earth, we need powerful magnets or lasers to do so. And the margins for error are miniscule. 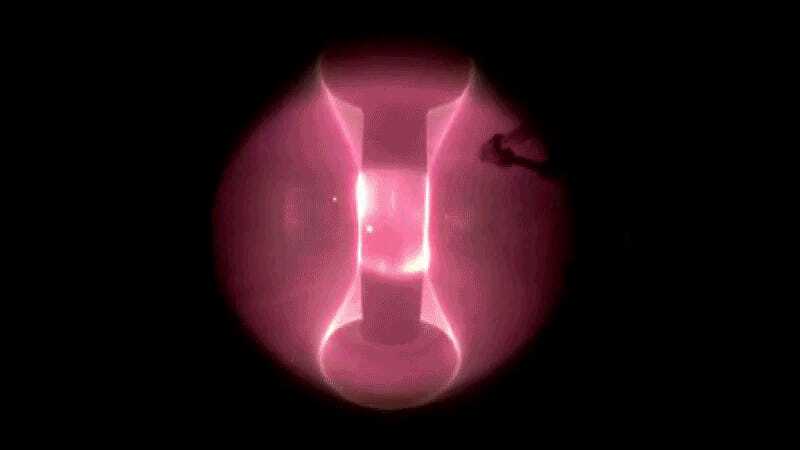 A teensy amount of escaped plasma can scar the wall of a fusion reactor, causing the machine to shut down. The field plasma physics blossomed out of a desire to bottle the stars. Over the past few decades, that field has expanded in myriad directions, from astrophysics to space weather to nanotechnology. As our general understanding of plasmas has grown, so has our ability to sustain fusion conditions for more than a hot second. Earlier this year, China’s new superconducting fusion reactor was able to contain a 50 million degree Celsius plasma for a record 102 seconds. The Wendelstein X-7 Stellarator, which fired up in Germany for the first time last fall, is expected to blow that record out of the water with runs of up to 30 minutes at a time. The NSTX-U’s recent upgrade sounds modest by comparison: the experiment can now keep a fusion plasma cooking for five seconds instead of one. But this, too, marks an important milestone. The NSTX-U will allow Princeton researchers to fill in some of the gaps between what is known of fusion plasma physics now, and what will be needed to build a pilot plant capable of reaching reaching that steady state burn and generating net electricity. For one, in order to find the best materials for containment, we need to better understand what’s going on between the fusion plasma and the reactor wall. Princeton is exploring the possibility of replacing its current reactor walls (made of carbon graphite) with a “wall” of liquid lithium in order to reduce long-term corrosion. More generally, the NSTX-U will help physicists decide whether the spherical tokamak design is one that’s worth pursuing further. Most tokamak reactors have a much higher aspect ratio, meaning they are less cored apple-shaped and more donut-shaped. The unusual shape of the spherical torus allows it to use the magnetic field from its coils more efficiently. Footage from the inside of the NSTX-U during a run. Image Courtesy of PPPL. Myers was loathe to estimate how far out we are from commercial fusion power, and you can hardly blame him. After all, it’s decades of excessive optimism that have harmed the field’s reputation and fueled the perception that fusion is a pipe dream—and that has had real funding consequences. Of course, we need to spend our research dollars carefully, and some fusion programs have racked up staggering bills. Take ITER, an enormous superconducting fusion reactor currently under construction in France. When the international collaboration began in 2005, it was billed as a $5 billion, 10 year project. After years of setbacks, that price tag has risen to roughly $40 billion. Optimistically, the facility will now be completed by 2030. But where ITER seems destined to swell like a tumor until it runs out of resources and kills the host, MIT’s stripped-down fusion program is showing what can be done on a budget. Last summer, a team of MIT graduate students unveiled plans for ARC, a low-cost fusion reactor that would use new, high temperature superconducting materials to generate the same amount of power as ITER in a device a fraction of the size.